Bento boxes you go my the volume in ml as a rough guide for the cals, so 600ml=600cal servings. But that`s if you`re doing Japanese style bento which is rise packed into half and the okazu packed into the other side. 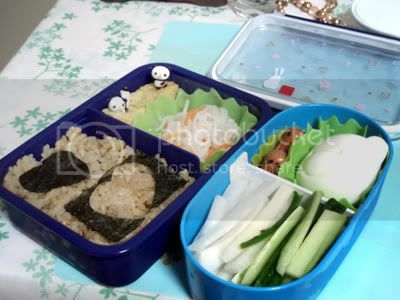 There`s plenty of blogs and stuff about bento now. Yeah, I get the calories thing, but my tummy doesn't go by calories XD After one box it was grumbling by the end of my work day and I ended up having a heavy dinner whereas before I liked to have a light dinner since it's late when I get home after work (around 11pm or so).